Photo by LORETTA JACKSON Pamela Richardson, of Hollis, shares a look at awards earned through membership in Merrimasters, a Nashua-based chapter of Toastmasters International, whose programs in 143 countries encourage 370,000 participants in 16,600 clubs to engage in public speaking in a supportive and positive learning environment where communication skills, leadership skills, self-confidence and personal growth thrive among friends. 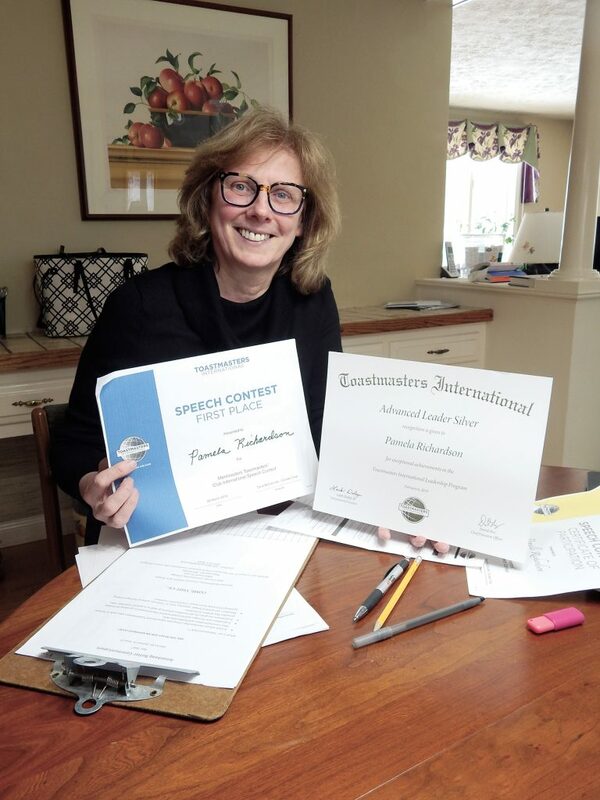 Nouns, verbs and adjectives adorned the sentences that Pam Richardson, MBA, a resident of Hollis, crafted into a speech that won first place at a recent Toastmasters International Speech Contest. Richardson is a four-year member of the local Nashua-based Merrimasters chapter of Toastmasters International. The Colorado-based international nonprofit, founded 90 years ago, embraces 370,000 members in 16,600 clubs in 143 countries. Richardson, currently the Merrimasters vice president membership and a speaker designated Advanced Leader Silver, said she selected a speech theme based upon an old adage – to whom much is given, much is expected. The independent money coach, a former social worker who now helps people have better relationships with their money, competed on March 6 against a trio of seasoned speakers. Contenders included Lee Guerette, of Nashua; Teresa Pelletier, of North Andover, Massachusetts; and Jennifer Morris, of Lunenburg, Massachusetts. All were vigorously applauded, Richardson added. She said that another round of speeches, March 30, will determine the Area 7 Champion, who will continue a chase for a berth in the District 45 International Speech Contest. Each district winner then proceeds to a Toastmaster International Convention to try for the title, World Champion of Public Speaking. This year the Aug. 21-24 convention will be at a grand resort in Colorado. The Nashua Public Library was the venue for the recent tournament, the Toastmasters International Speech Contest for Merrimasters Toastmasters. 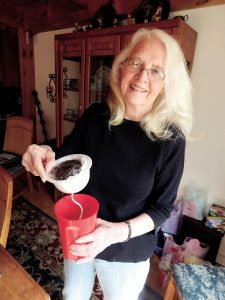 The president of Merrimasters is Patricia Henderson, of Wilton. Merrimasters Area Director Lorri Menard, said Richardson captured the victory because of an engaging attitude that connected with the audience. She applauded fellow Toastmasters at the meeting of March 20 for great showmanship and sportsmanship. The speakers included Nancy Hesby, of Nashua; Pablo Halpern, of Wilton; Susan Lynch, of Hollis; and Greg Ross, of Merrimack; along with Diala Chinedu, of Nashua; and Dave McConville, of Nashua, who is vice president education. Richardson offers an invitation to the curious to visit a Merrimasters meeting. They are hosted on the first and third Wednesday of the month, 12-1 p.m., at the Nashua Public Library, 2 Court St. Guests attend at no charge. Information on Merrimasters Toastmasters can be had online: merrimaster.toastmastersclubs.org.